Two winters ago, we two Quails journeyed from Barcelona to southern France on New Year's Day, to look at ruined castles in the Pyrenees and to partake of that most wonderful of casseroles, cassoulet. And it was an epic affair, brimming with creamy beans and rich porkiness from slow-cooked pork, and little melt-in-your-mouth strips of pure pork fat (picture pork belly). I wanted to live inside that bowl. So now, as the Tour de France begins to travel through that same neck of the woods, I got the craving for something cassoulet-ish. Now, I've tried my hand at making the real thing before, but it's a nine-hour process that really doesn't compress well into post-work hours. So I decided to improvise. This sure ain't cassoulet, but it's a sort of pork-and-beans variation I've never made before. 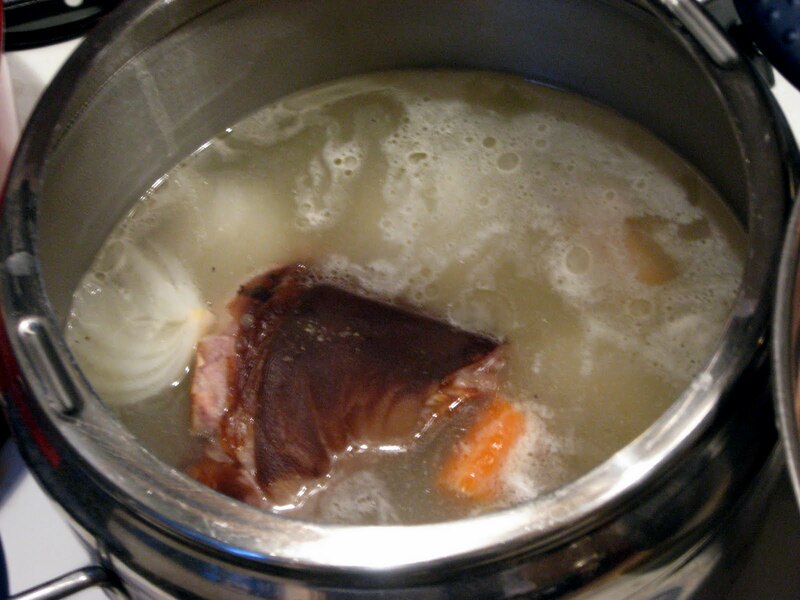 First, I threw stock ingredients into my pressure cooker: ham hock, onion, garlic, carrot, celery. I let this cook under pressure for about an hour while I prepared everything else. Okay, here's where it gets creative. 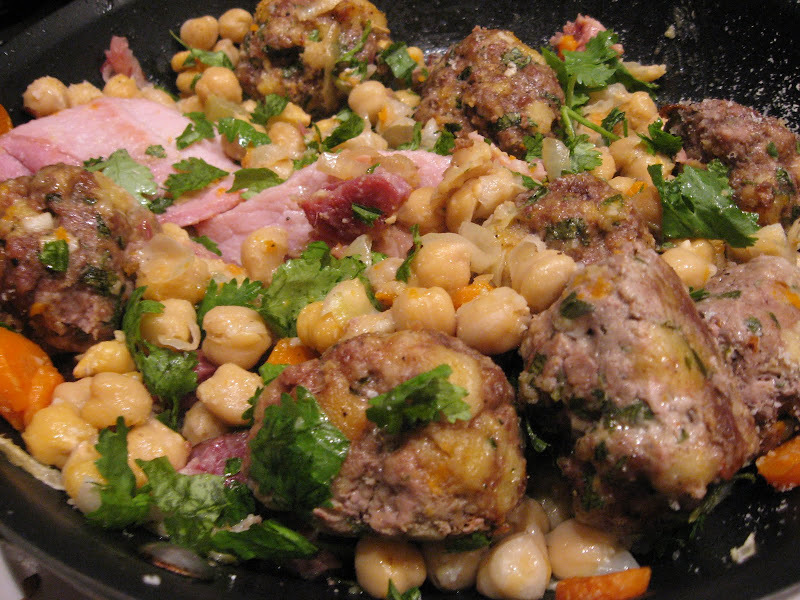 Cassoulet has a few variations, one of which involves adding duck confit. So it's not always just pork. I went a different route: lamb meatballs. I got this idea from watching Chuck Hughes make stuffed cabbage. 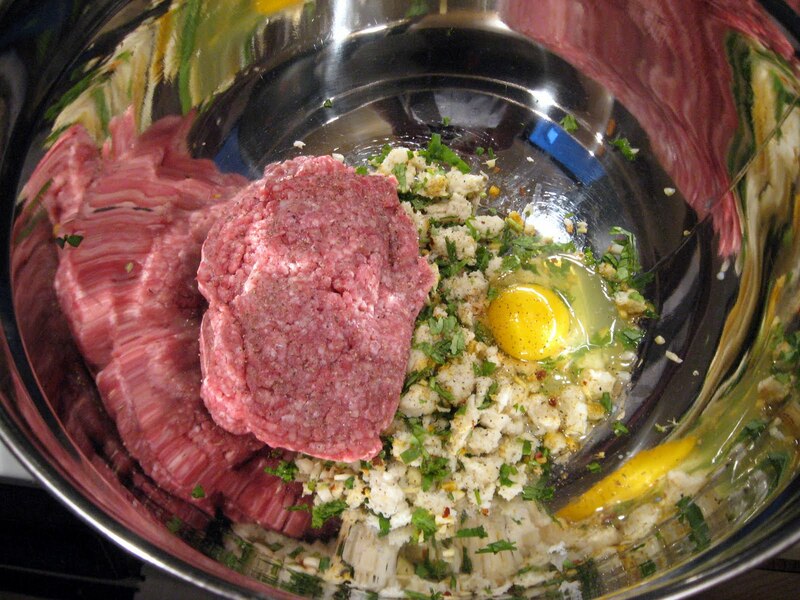 What we have here is ground lamb, one egg, bread soaked in milk then squeezed dry and broken apart, cilantro, garlic, red chili, salt, pepper, and minced ginger. Oh, and a little touch of the ol' ras el hanout, because why not? To be honest, I later wished I'd added a little parmigiano like in an Italian meatball, so if you'd like to do so, go right ahead. 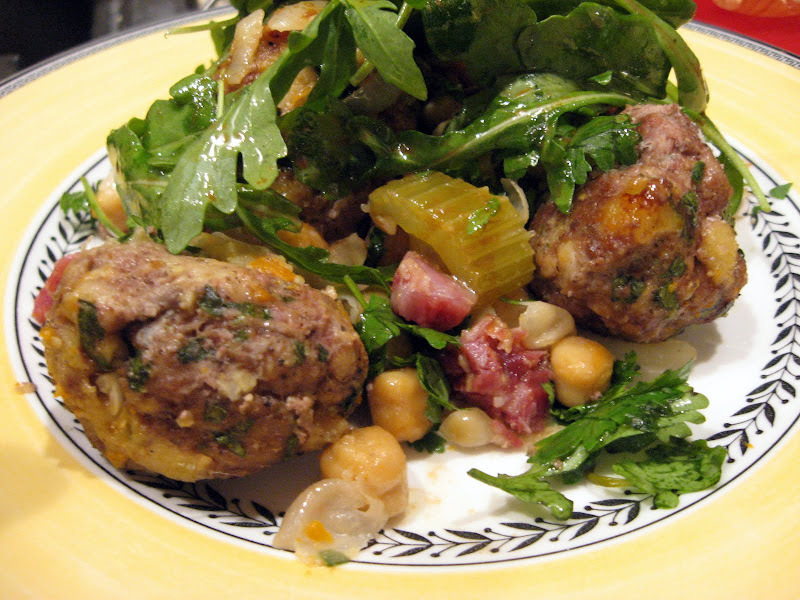 Now that I think of it, this idea also came from our Culinaria "European Specialties" cookbook, which I look at obsessively, and in which is both a great recipe for cassoulet and a version of another porky dish, choucroute garnie, which included meatballs in with other cured meats and sausages. Sometimes it's hard to remember where these combinations come from, but I'm pretty sure that's it. 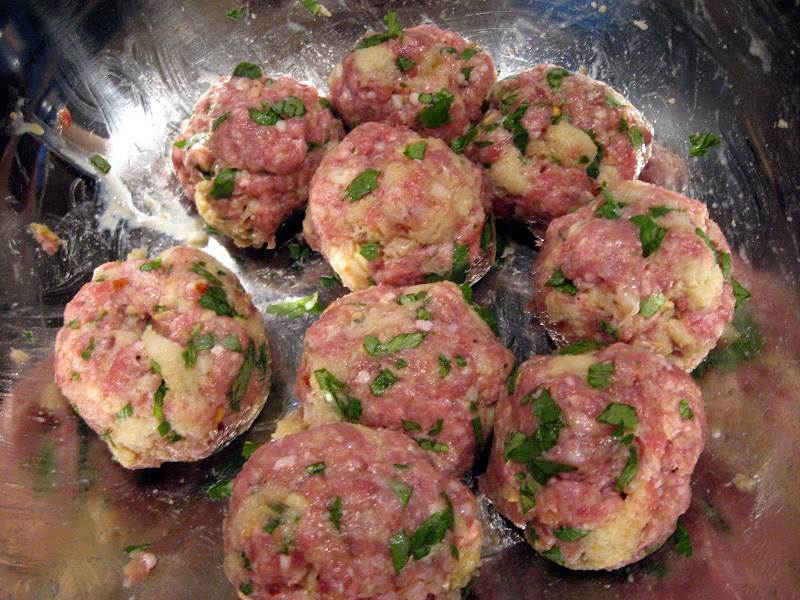 Anyway, the mixture is formed into balls, thrown in a pan, and baked at 375 degrees for about 15-20 minutes. While they were baking, I stopped the pressure cooker, pressed the vegetables in a strainer, and then threw in a can of chickpeas (which we often have around the house) with a little more garlic and some sliced carrots. Back under pressure it goes, basically to let a little porkiness get into the beans. Just as the meatballs were finishing, I added a final touch. I sauteed some onions and yes, more garlic, in olive oil along with two pieces of Irish bacon (a leaner bacon made from pork loin instead of belly.) The Irish bacon gets tough and flavorless if it cooks for more than a couple minutes, so at that point I added the meatballs, beans, the meat from the ham hock, more chopped cilantro, and some grated parmigiano. Topped with a simple arugula salad dressed with vinaigrette, that's the dish. "Easy" two-hour pork-and-beans. It seemed natural to pair this dish with a red wine (even this beer drinker can recognize a pairing as obvious as that...although we had white wine in France...) I recently watched one of Gary Vaynerchuk's irreverent and entertaining and mildly unhinged Wine Library TV shows on Loire Valley Cabernet Franc, and liked the way he talked about it being barnyard-y and funky and vegetal and a lot of other things that aren't bright and fruity. I've been looking for old-world character, so we decided to give it a whirl, even if Gary is a Jets fan (go Pats.) Nobody's perfect - not even the '72 Dolphins. 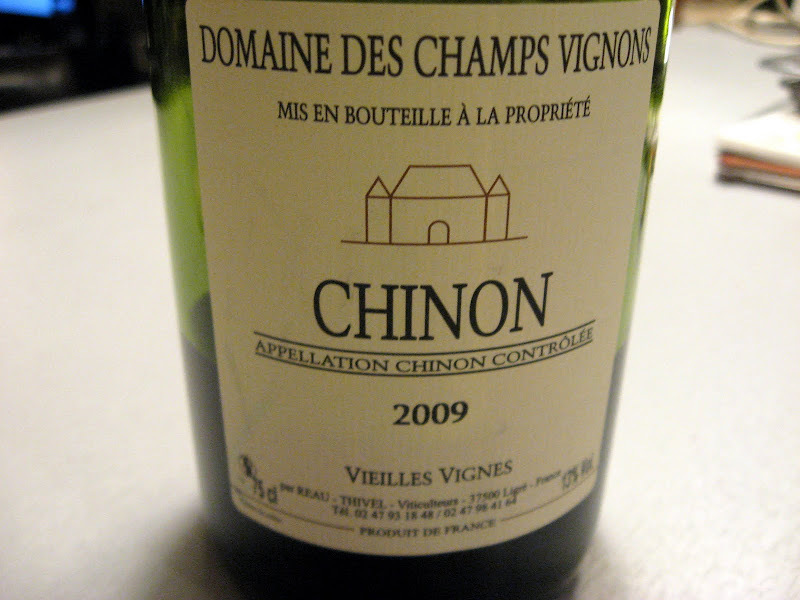 As I learned from Gary's show, the "Vieilles Vignes" at the bottom there means this was made from old vines, which can give the wine even more of that barnyard character. And it certainly had that. I liked this earthy, funky, musty wine, and precisely for having those flavors, and especially after we decanted the bejeezus out of it (I'm sure it should've been cellared for a few years, but we didn't have that kind of time, or a cellar, for that matter.) With a glass of this, a serving of my bastardized cassoulet, and Phil Liggett and Paul Sherwen giving the play-by-play as little Tommy Voeckler holds the mighty Alberto Contador at bay, while looking at helicopter shots of the Alps and the Pyrenees, why, we're nearly transported to France. Oh, who am I kidding - where's my plane ticket!? Go Pats! Go Voeckler! Allez allez allez!